Yep - it's official, Distilled are now great in bed. Must be true - Facebook told me so! While the above fact may be true, it's not really the right topic for discussion on this blog so what am I talking about? Well Distilled now have a facebook page, come join us here: Distilled on Facebook! So what are you waiting for? 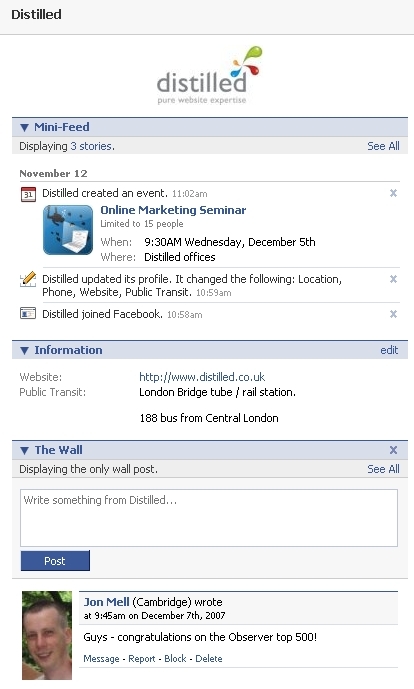 Become a fan of Distilled now. To all my personal fans out there - I'm rushing off on holiday tomorrow so probably won't be blogging again before Christmas. Hopefully Will and Duncan will be able to keep the blogging up while I'm away. Merry Christmas all!